Do you suffer from knee pain? Knee pain can have many origins and can easily be put into two main categories. Traumatic vs functional. Traumatic injuries often warrant more immediate imaging and surgery, while functional usually requires a different approach for the problem to truly be corrected. Functional knee pain is very commonly caused by core musculoskeletal imbalances that are developed over time with poor biomechanics, posture, and habits. 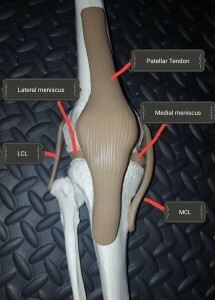 In order to understand knee pain, we must first look to the anatomy for a generalized understanding. Most cases of knee pain actually are induced by a lumbopelvic imbalance, but let’s first take a look at the knee itself. 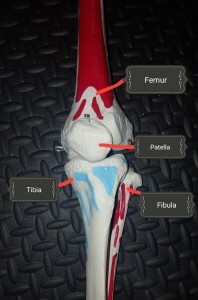 The knee is the largest joint of the body and is composed of four bones called the femur, tibia, fibula, and patella. These four bones are supported by the main surrounding ligaments: the anterior cruciate ligament (ACL), posterior cruciate ligament (PCL), medial collateral ligament (MCL), and lateral collateral ligament (LCL). 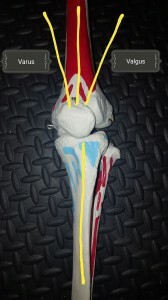 The ligaments primary goals are to hold the bone together while conforming to the joints normal motion. Ligaments can be easily described as being like a stiffened rubber band. Like with all joints, the surrounding muscles play an integral role as well. These will be more generalized classified for ease of understanding. We have the quadriceps, hamstrings, and calf (soleus and gastrocnemius) muscles. These variations in static posture are accounted for by physicians when considering proper diagnoses for functional knee pain. Now that we’ve established the anatomy of the knee, we can now discuss the specifics of why knee pain occurs due to the problems in the knee itself. 1. Subluxation- Subluxation is defined in chiropractic as any joint that becomes slightly misaligned or stops moving properly. When the knee becomes subluxated, nerves become irritated leading to pain. 2. Ligamentous weakness or sprain- In addition to the muscles supporting the knee, there is a multitude of ligaments that help keep the knee joint in place as well. When these ligaments become weak or injured, it can lead to knee instability that often leads to pain. 3. Muscle weakness or injury- The final major cause for knee pain originating from the knee itself, is due to problems associated with surrounding musculature. These muscles provide the vast majority of support to the joint in all instances and are responsible for much of the knee’s movement and range of motion. These muscles can weaken and/or tear over time due to repetitive stress or imbalances that develop over time, leading to pain. Lumbopelvic muscles are divided into 4 main groups and their function is largely determined by their structural location around the core of the body. 1. Flexors – Any muscle located at the front half of the pelvis or lumbar spine is considered a flexor. To envision the action of a flexor, it is the motion of bringing your chest to your knees. 2. Extensors- Any muscle located at the back half of the pelvis or lumbar spine is considered an extensor. Extension is performed when arching the lower back. 4. Rotators- Muscles that rotate the core can be located in any structural location of the lower back. To envision the action of core rotation, it is simply the action of swinging a bat. Any muscle of the lower back can belong to more than one functional group listed above. For example, the quadratus lumborum muscle has the ability to extend, laterally flex, and rotate the core. 1. Subluxation- As mentioned above in the discussion of the knee, subluxation is defined in chiropractic as any joint that becomes slightly misaligned or stops moving correctly. The most common type of subluxation in the lower back involves the facet joints. 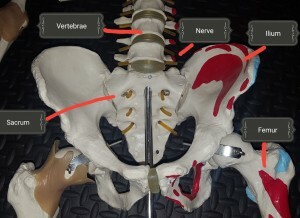 The facet joints are the most posterior joints connecting each of the five lumbar vertebrae. When the facet joints become subluxated it can lead to the irritation of the nerves that extend into the knee joint causing knee pain. 2. Disc problems – The discs located between each of the vertebrae can bulge and herniate. Located in the center of each disc is a gelatinous material. Over time the walls of the disc can weaken and break down, allowing the gelatinous material to push out or bulge toward the outside of the disc. If the wall breaks and the material actually leaks out, this is called a herniated disc. The problem with a disc bulge or a herniated disc comes when the displaced disc places pressure posteriorly toward the nerve roots that are exiting on either side of the spine at any of the various levels of the vertebrae. This can cause not only lower back pain but also the pain in the knee as well. Below are some suggestions for things that you can do for yourself at home to help relieve your knee pain. 1. Apply ice- Many find considerable relief from applying ice to the knee, Ice works to reduce inflammation and swelling thus providing relief. Apply ice for 15 minutes every 2-3 hours as needed. 3. Take NSAIDS- Non-steroidal anti-inflammatory drugs like ibuprofen can be taken to reduce swelling in the knees. By reducing swelling, more space is created in the knee capsule, thus allowing for easier mobility and blood flow to the area. 4. Stretching- Some simple stretches to help maintain mobility and decrease pain are the knee is a seated toe touch, pulling your heel to your buttock, and the standing achilles stretch with your foot propped against a sturdy surface. You want to reach to the point of “pull” and don’t want to push it past the point of actual pain. Do these a few times per day, holding for 10-15 seconds at each area. 5. Strength exercises- Clinching the quadriceps muscles for 5 seconds and doing the same while doing a leg lift are good isometric exercises for almost all knee conditions. Make sure to breathe frequently during the exercise and repeat them up to 10 times per side daily. For prevention, when done properly: body squats, wall sits, and lunges are the most common go-to exercises for preventing knee pain. Strengthening the quadriceps, hamstrings, and gluteal (buttock) musculature is the best way to prepare the joint for repetitive stress or high-intensity situations. strain the tissues around the knee but also frequently contribute to knee pain syndromes. If having knee pain, use the stronger leg to lift yourself upstairs and always use a handrail for stability. 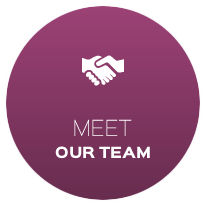 Being a multi-specialty clinic, there are many ways that we can treat knee pain within our walls. necessary to stabilize knee pain, but many find considerable relief after the first adjustment alone. a. Cryotherapy – cold pack treatment helps reduce inflammation and thus reducing pain. b. Stretching- stretching helps to loosen tight muscles that are in spasm, thus reducing pain. c. Strengthening- specific exercises can be given to strengthening weak muscles, thus restoring muscular balance to the knee or lumbopelvic areas. d. Axial decompression- This is a specialized form of treatment typically for the treatment of disc bulges or herniations in the lower back. The patient is placed on a special computerized table that gently and slowly distracts the spine over a 30-minute session. The action of the distraction creates a negative pressure or “vacuum” effect that draws the disc material back inside, thus getting pressure off the nerves that are being compressed in the lower back causing knee pain. 3. Acupuncture – Acupuncture is an ancient healing art that originated in China over 4000 years ago. The premise of acupuncture is based on meridians (or pathways of energy) that run throughout the body. When a practitioner of acupuncture places needles into the body, they are placing those needles on key points along those meridians in order to manipulate that energy to promote healing to that area of the body. Treatment typically takes about 20 minutes to complete and is painless. Acupuncture is very effective at treating knee pain and restoring the overall function of the body. 5. Massage- Often knee pain is the result of tight muscles. Or sometimes the tight muscles might result from having the knee pain. Either way, knee pain can be relieved with a massage by relaxing muscles, increasing blood flow to help speed up healing and flush out toxins in the local soft tissue. If you or someone you know is suffering from knee pain, we may be able to help you at Health Quest through chiropractic, physical therapy, massage, acupuncture, or family medicine. At Health Quest, we are committed to helping you meet your health goals and leading you to a healthy and pain free lifestyle. Call us today to schedule an evaluation at 573-635-9655.